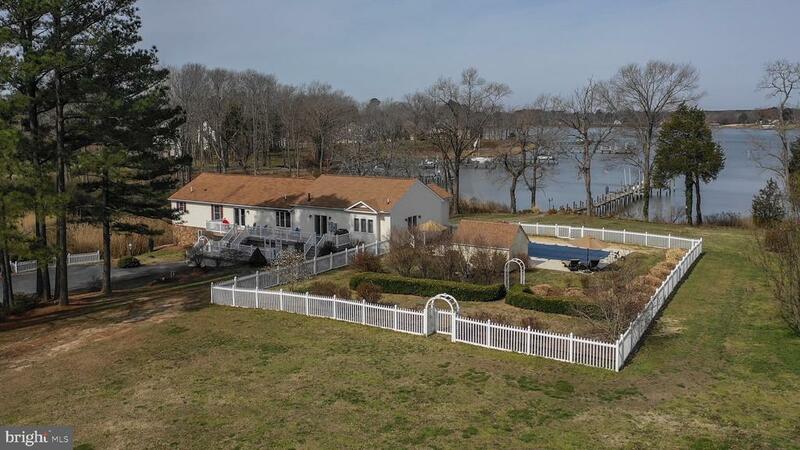 This is a very private and spacious waterfront home on twelve acres with 300 feet of waterfront and a pool. The home offers 2550 square feet with 9 rooms on the first floor. Rooms are: (4 bedrooms, kitchen, family room, dining room, sitting room, mud/laundry, office, a walk-in closet and 3 full baths compliment the 9 rooms). The first floor is surrounded by composite decks with vinyl railings, and a screened porch for enjoying breakfast, lunch or dinner with a water view. The finished 1456 square basement offers 4 rooms with: (a recreation room, summer kitchen, sitting room, flex room and a full bath for convenience). The home has Andersen windows and doors, Hunter Douglas window treatments, and walk-in closet and office designed and installed by Closet Factory. The property is landscaped with many flower beds, shrubs, trees, and a fruit tree orchard. The wild life is abundant with squirrels, rabbits, deer, and waterfowl for all seasons. Salt water fisheries are very good with an assortment of fish, blue crabs, oysters, and clams. The striped bass is the big game fish for this area. The home is fronted by the protected Lower Machodoc River, a tributary of the Potomac River. The neighborhood consists of 30 lots with 26 homes. All homes and lots are protected by covenants monitored by Grand View Landing Property Owners Association. The property is accessed by a private 510~ paved driveway or by boat from a 180 foot pier on the Lower Machodoc River. Visit Google Earth on the internet to see an aerial view of neighborhood, home, pool, driveway, privacy, and river. Recreational boating is great in the protected Lower Machodoc and for the adventurous, the Potomac River. The Chesapeake Bay is a 30 to 45 minute boat ride to the South-East and Maryland restaurants are 15 to 30 minute boat ride to the North. Two other parcels are not included in the tax assessment that compose the over 12 acre parcel.